Anyway, Digium has been up to some very good things. They recently announced Asterisk Business Edition, which essentially is a turn-key version of Asterisk that has gone through a rigorous testing process by Digium. This saves enterprise users time and money, and reduces risk since it has been proven to work right out of the box after configuration. "By creating Asterisk Business Edition, Digium has taken open source telephony to the mainstream," said Mark Spencer, president of Digium. "Digium recognizes the needs of the enterprise user to cut costs by using Asterisk, and our new Asterisk Business Edition offers the additional peace of mind that reliability is not compromised with open source software." The Digium folk also mentioned they have some major announcements coming out in just a few weeks. No doubt at one of the VoIP tradeshows. We'll have to wait and see what happens. 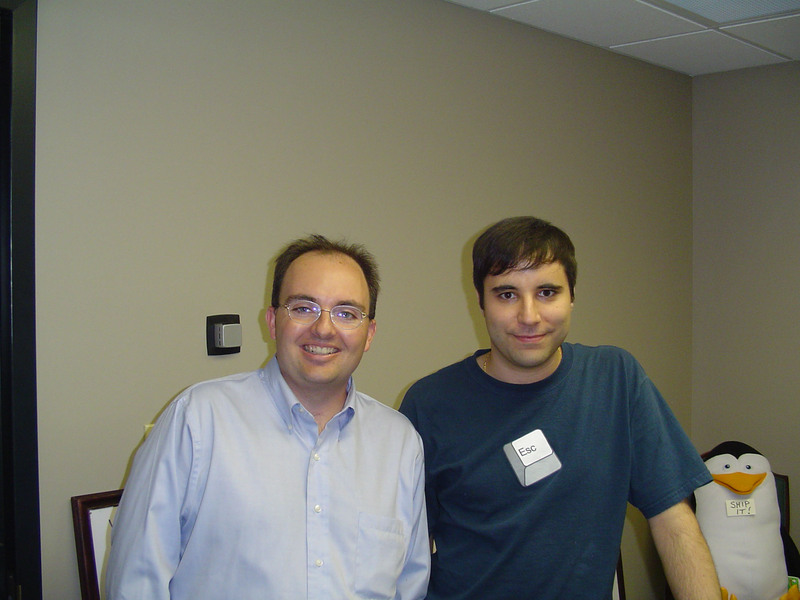 On a side note, I should mention that in my Adtran meeting they mentioned they knew Mark Spencer and that Mark actually did an internship with Adran. Adtran spoke very highly of Mark and they are highly supportive of Digium. Digum gave me the grand tour of their Huntsville, Alabama facility and I have to say, I felt very old at just 34-yrs old when I walked through their facility. Their offices was filled with 20-somethings... many of which look like your typical Linux geeks. That is meant as a complement of course! ;) Some very intelligent people work there. The environment was pretty cool and very relaxed - I even saw someone playing a video game and shouting as he scored a kill in a shoot em' up game. The atmosphere kind of reminded me of when I visited <cough!> the Microsoft campus in Redmond where they had some game rooms, free soda, etc. I couldn't tell what game the Digium employee was playing, but no doubt it must have been a game supported on Linux such as Quake. Relatedly, I asked Mark Spencer if his entire corporation was 100% Windows-free and he said "almost". All but one application was running under Linux. When pressed for what application that was he told me their one Windows app was a popular Windows accounting software, which they were in the process of migrating to a Linux accounting program. I asked Mark if he knew I wrote the first article covering Asterisk before Asterisk hit the "big time" and became well known. The article was published in November 2001 within Communications Solution Magazine (article was written a few months earlier due to magazine lead times). I actually covered a plethora of open-source Linux-based IP-PBXs in the article. Alas, he wasn't familiar with the magazine or the article. He never even heard of CTI Magazine either. :( I've been in telecom way too long! Digium also told me about how they have been working with other hardware manufactuers such as Aculab to certify them to work with Asterisk. Since Digium makes their revenue on their hardware boards, at first that seemed counter-intuitive to enable their "competitors" to work with Asterisk. However Mark explained they have a revenue-sharing model with their hardware partners. I asked Mark about another company, Sangoma and if they also did a revenue sharing model, however Mark's comments were strictly off-the-record. If you want to know Mark's thoughts, you'll have to ask Mark directly. In any event, while you can simply download Asterisk, buy the hardware and install it yourself, it does require a bit of Linux know-how and even then it's by no means a turn-key installation. Asterisk Business Edition addresses that by offering a turn-key solution. The advantage of Asterisk Business Edition is that non-techies, Linux novices, or just simply someone that wants a certified Asterisk PBX can get a turnkey Asterisk solution on certified hardware that has been thoroughly tested. At $995, this is a steal price compared to just about any feature-rich IP-PBX.You also have the option of looking at a customized hosted Asterisk-solution such as Fonality and Switchvox. When discussing "SIP vs. Asterisk's IAX protocol" Mark commented on the complexities of SIP as well as the advantages of the IAX (Inter Asterisk Exchange protocol) protocol. For instance, he mentioned that they were able to get IAX onto a gateway that had merely 4K of RAM with a paltry 8-bit microcontroller and just 64K of flash. Mark has pointed out in the past that the reason SIP has trouble going through NATs is that it connects on separate ports and there are all kinds of asymmetries that are allowed. He mentioned that IAX succeeds through NATs because it instead uses one port. Also, instead of using Real-Time Protocol (RTP) for signaling and media, IAX uses User Datagram Protocol (UDP) over a single port (Port 4569). Because of this it also uses less overhead than RTP, thus increasing the number of calls sent through a particular data pipe. Mark states that SIP is handicapped bacause is has to stay backwards compatible with previous versions, which adds additional protocol complexity. The benefit is anywhere from 2.4k for a single call to approximately tripling the number of calls per megabit for G.729 when measured to the MAC level when running trunk mode. As proof of IAX's presence, Mark pointed out that Global Crossing uses IAX for its last-mile connection. Intel also seems to be a fan of Asterisk. At TMC's recent VoIP Developer show Mark Spencer and Intel's director of Intel's VoIP strategy group, Michael Stanford keynoted. Intel's Michael Stanford said, "Intel says services is a big market, and Digium is a way to get there. Resellers in particular might find Asterisk and Digium attractive, since it could allow them a cost-effective way to add custom features to basic call-center application functionality and reap higher margins than by just reselling off-the-shelf applications and hardware." It wouild be cool if Asterisk supported Intel's HMP (Host Media Processing), a specification that leverages the host processor (i.e.Pentium chip) for voice processing as opposed to expensive DSPs. On a related note, Artisoft (now Vertical Networks), an IP-PBX software company, had the first commercially scalable release of Intel's HMP architecture, which replaces Intel's currently required, expensive telephony DSP board with software running on an Intel server chip. So will Asterisk follow suit and one day support Intel's HMP? If so, that would be very very interesting indeed. This would be major news for the Asterisk community. 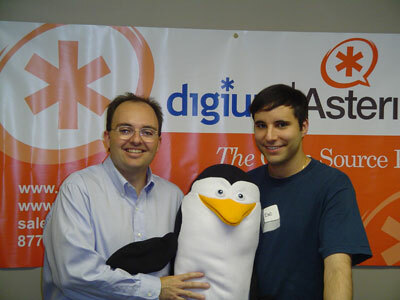 Finally, one more photo to share with Mark and me in it along with the infamous Linux penguin. Their office is littered with every variety of penguins. I know what you're thinking - "Hands off the penguin, Tom. Now, slowly step away from the penguin..."
In any event, while you can simply download Asterisk, buy the hardware and install it yourself, it does require a bit of Linux know-how and even then it's by no means a turn-key installation. Asterisk Business Edition addresses that by offering a turn-key solution. The advantage of Asterisk Business Edition is that non-techies, Linux novices, or just simply someone that wants a certified Asterisk PBX can get a turnkey Asterisk solution on certified hardware that has been thoroughly tested. At \$995, this is a steal price compared to just about any feature-rich IP-PBX.You also have the option of looking at a customized hosted Asterisk-solution such as Fonality and Switchvox. It wouild be cool if Asterisk supported Intel's HMP (Host Media\nProcessing), a specification that leverages the host processor (i.e.Pentium chip) for voice processing as opposed to expensive DSPs. On a related note, Artisoft (now Vertical Networks), an IP-PBX software company, had the first commercially scalable release of Intel's HMP architecture, which replaces Intel's currently required, expensive telephony DSP board with software running on an Intel server chip.